Unfortunately, in our society, anyone can sue anyone so long as they have the filing fee. It is very easy to file a lawsuit against a business or another party. In modern America, planning for a lawsuit and knowing what to do when you have been sued are an important part of running a business. If you or your business are sued, you will be served with process. We’ve all seen this in the movies. Someone will come up to you and hand you paperwork and tell you that you’ve been served. The paperwork will contain a short explanation about what it means to be sued as well as a copy of the lawsuit. This article discusses the steps you should take if you find yourself in the unfortunate position of being sued. The first and most obvious step is to call your lawyer. Responding to a lawsuit is a complicated task and it is certainly something you don’t want to attempt yourself. Additionally, you want to make sure that the lawyer you consult with is familiar with the specific type of case with which you are involved. You may need a different attorney to handle a breach of contract lawsuit than an attorney who handles negligence cases. Additionally, as you will find out by reading the rest of this article, there are deadlines and certain procedures that need to be followed shortly after a lawsuit is filed against you. If these procedures aren’t followed properly, you might waive important defenses or advantages. One of the things that might need to be filed on your behalf, prior to an answer, is a legal document called a special appearance. A special appearance allows a defendant to challenge the court’s jurisdiction over the defendant without becoming subject to it. The U.S. Constitution guarantees that a Defendant cannot be bound by the judgment of a court in a jurisdiction with which the party has established no meaningful contacts, ties, or relations. Deciding whether or not to file a Special Appearance is a decision and a task best left to your attorney. However, because of the relative rarity of a Special Appearance, it is worth asking your attorney if your case qualifies for a Special Appearance. If your case is not eligible for a Special Appearance, but has been filed in the wrong or an improper county in Texas, you may want to file a motion to transfer venue. For example, maybe the case was filed in Galveston County, but it should actually take place in Harris County. A motion to transfer venue is the procedure for transferring a case to another county in Texas. There are three types of motions to transfer: (1) improper county and convenience of the parties and witnesses, (2) local prejudice, and (3) consent of the parties. Only the defendant can file the first type; either the plaintiff or the defendant can file the second and third types. Much like the Special Appearance, a motion to transfer venue must be filed prior to the answer, and is a task best left to a qualified attorney. Again, it is worth asking your attorney about challenging the venue, as it can be easily overlooked. 5. SHOULD THE CASE PROCEED ELSEWHERE? Lastly, a forum non conveniens (FNC) motion asks the court to dismiss or hold a lawsuit because a court outside Texas that has jurisdiction over the dispute is more appropriate. The FNC doctrine presumes at least two forums have jurisdiction over the dispute. As you can see, the things that may need to be done prior to answering a lawsuit are numerous, complex, and important. The next thing that needs to be done is filing your answer to the suit. The paperwork you were served with should contain the deadline to file an answer. 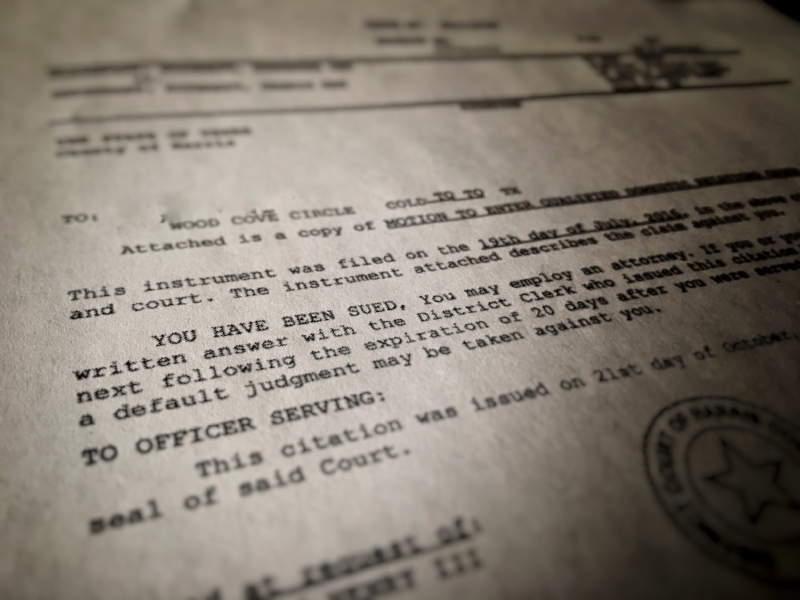 In district and county courts, the defendant must file its answer by 10:00 a.m. on the first Monday after the expiration of 20 days from the date the defendant was served with the citation. If you fail to file an answer, you open yourself up to a default judgment. A default judgment is a judgment obtained against a defendant by the Plaintiff proving his or her case without opposition. If you are able to file an answer within the applicable deadline, the case will proceed forward and there is not the same easy path to a judgment for the Plaintiff. This is one of the most important deadlines and pleadings in a civil litigation case. Obviously, no one wants to be sued. It’s a stressful, complicated, and costly ordeal. However, knowing how to deal with that kind of adversity is essential. Obviously, this article is not intended to be a replacement or substitute for licensed qualified legal counsel. This article is intended to give you a starting point and some general education. Keep in mind that we are here to help! If you’ve been sued or if you need to sue another person or business, seek quality help and advice. You will get through this! My staff is standing by to help and answer any questions you may have. Send us an email or call (713) 999-9398. Got Questions? Click here to ask.